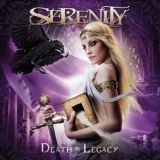 As my colleague Thomas pointed out in his review of Serenity’s 2008 album Fallen Sanctuary, the band have moved away from their roots considerably, and third full-length Death & Legacy is no exception. Cynics would say that the Austrian five-piece seem to have been searching for a sound for themselves over their first two albums, yet they seem to have stabilised that sound here with a good mixture of the symphonic, the progressive, and the catchy. In terms of genre progression, there’s still not much to distinguish Serenity from the competition – their biggest selling point is still, for me, the fact that their first bassist was called Stefan Wanker. Can’t beat a name like that, except with some pretty tasty tunes – fortunately for the band, they have tunes by the bucketload. First track proper New Horizons is a Kamelot-meets-Edguy-esque anthem that moves between orchestral pomp and heartfelt chorus with professional precision, adding well-placed female vocals on the following The Chevalier, which steals gothic metal emotion and adds it to power metal pomp for an excellent combination. Whichever song you listen to, it’s pretty clear that Serenity have a knack for writing infectious choruses, whether Far From Home’s wistful conquering spirit or Heavenly Mission’s religion-fused mania. All of them have more than capable backing guitars and solo sections, and that’s what really gives Death & Legacy the score it deserves. As much as vocalist Georg Neuhauser deserves plaudits for all the ear candy he ceaselessly offloads, it’s the band as a whole that put the filling in the sandwich. Barring a few skippable interludes, there’s very little here that will offend anyone with ears, especially since the band start to mix things up a little as they go on, State Of Siege’s epic build-up to balladic centre section being very well-handled, especially since they have yet another great chorus to wail along to and extended soloing for the air guitarists. I must admit, I’m impressed; sixteen tracks on an album that stretches over an hour is rarely the best way to impress, yet Serenity do such a good job of it that it’s hard to care about the album’s length. The only real disappointment is that Serenity stick to the same song lengths throughout, when a good 10-minute epic would be the icing on the cake. As it is, however, there’s plenty of goodies to make up for it, When Canvas Begins To Burn as anthemic as any of the band’s offerings if not moreso, and interlude Below Eastern Skies featuring some enjoyably authentic eastern wailing and percussion. Ultimately, Death & Legacy isn’t a marvellous album, but it is a very good one that will have you singing along for days, and there’s little more I want from power metal.